Wondered why the spare plot of land next to Galerie Montmartre on Moor Street has been vacant for some time? It’s just been waiting for the perfect business to fill out its sunny space – and it’s finally arrived in the shape of Tim and Mark’s Grub Food Van. We ventured to the newly-opened Grub Food Van last week, and were so chuffed by the whimsical environs, killer short black and general air of jollity that we simply had to feature the jumped-up caravan of treats on the Ruby Assembly blog. 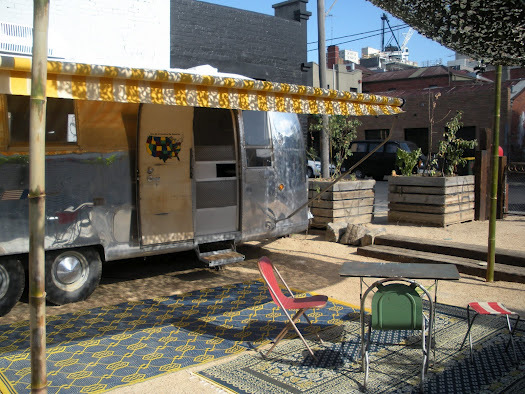 Set amongst gardens, sheltered by shadecloths and featuring persian carpets and colorful umbrellas – the Grub Food Van is a retro-tastic caravan with serious hospitality chops. I won’t ruin the surprise of the whole experience by describing it too much. Enjoy, and go visit dammit. Here’s Tim to tell us more about Grub Food Van and his influences. 1. 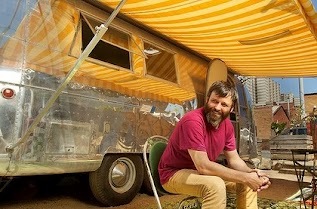 What inspired you to bring a retro caravan from overseas to Australia? Was this an idea you’d been sitting on for some time? Really, one thing led to another. We bought a factory to convert to our home. It basically was too big for two. We knew there were probably too many café’s in Fitzroy, so what we wanted to do was produce a product to supply those cafes – that seemed to make good business sense. It was when urban farming was “on the table”. Accordingly we converted the downstairs area into a greenhouse to grow basil, to make pesto. We don’t actually like pesto. The next logical step, in order to get the best margin on that pesto, was to convert our (useless) car-park into a place to off-load it. A caravan seemed like a sensible alternative because we could always move it off site, to where the pesto was most needed – a kind of pesto-mobile. It very simply snowballed into another café. 2. What are your unique skills in creating magical hospitality venues? I believe everybody else has unique skills, just not me………..
3. 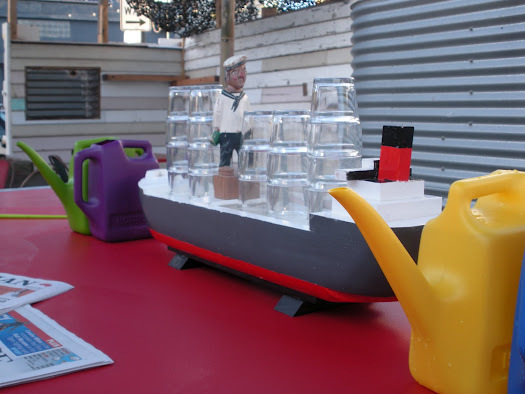 How did your lightbulb moment in creating the Grub Food Van come about? Probably when thinking that plants were potentially nicer downstairs tenants than people. 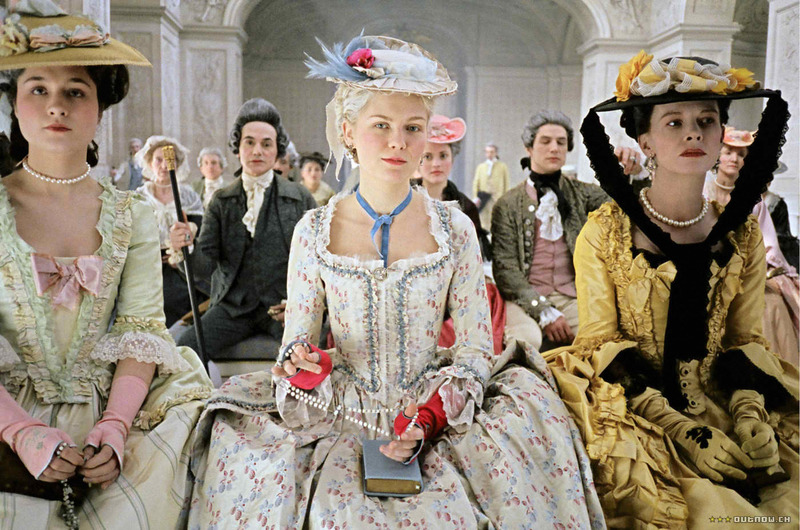 I have a shocking memory, but do suspect that I can remember being Marie-Antoinette and helping to define decadence at Versailles. 5. What would your last meal be? Supposedly, drowning is a relatively painless death – seafood? 6. What is your best tip for choosing business partners? I don’t believe in business partnerships, but if absolutely necessary, try to recognize people who are prepared to compromise more than oneself. Is silence a sound? I don’t believe in quantifying values, and I also believe it’s very contextual. In terms of Grub Food Van, we were always non-negotiable that the background sound would be a default of the surroundings, hence the strict no music policy. 8. Who would you like to invite to dinner at the Grub Food Van? 9. 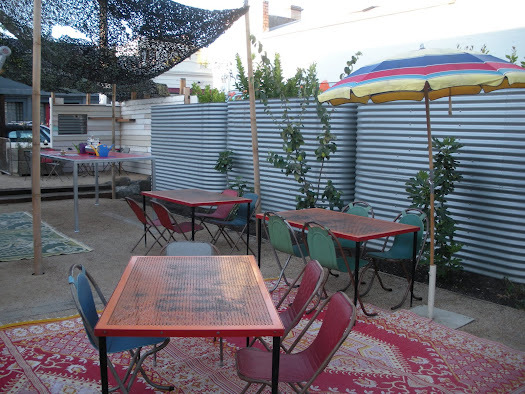 Why do you think Melbournites are so into mobile food venues at the moment? Hmmmmm – I actually believe “Melbournites” are suspicious of fads. I’d hope that the Grub could build its’ reputation through aspects of sustainability, rather than any wow-for-now factors.